In “Tappin’ Thru Life,” Maurice Hines looks back on a passion for tap that began when he was tiny. Maurice Hines may be nearing 70, but he exudes the energy and infectious enthusiasm of a kid with a new toy. He talks a mile a minute, is quick to laugh, and, God in heaven, does the man have stories. 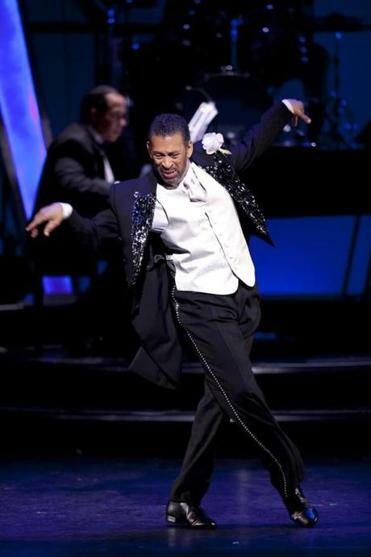 Hines brings his stories, songs, and dances to the Cutler Majestic Theatre May 14-19 in his show “Tappin’ Thru Life.” Infused with personal reflections, the show, presented by ArtsEmerson, traces Hines’s six decade-plus career and is a tribute to his brother Gregory, who died in 2003. Backed by the Berklee College of Music Jazz Ensemble playing arrangements by Nelson Riddle and Tommy Newsom, the show also features two young tap-dancing brothers, whom Hines has been mentoring for the past three years. So young Maurice would go home after lessons and show his little brother everything he learned. “He could just look at a step and do it,” Hines says. Their parents quickly realized the boys’ talent and took the two to study tap with Broadway choreographer and teacher Henry LeTang, the premier instructor for children at that time. LeTang began creating routines for the duo, patterning them after the famous Nicholas Brothers. The Apollo became the Hines brothers’ theatrical home. “That’s how I learned my craft,” Hines says. “Every week there was a different star, and I’d be watching. I’m so blessed to have had that life.” As the two young boys developed into full-fledged hoofers, they became a touring act, opening for Gypsy Rose Lee, Lionel Hampton, and others. With the addition of their drummer father, Maurice Sr., the act morphed into Hines, Hines & Dad, and racked up nearly three dozen guest appearances on “The Tonight Show.” “Johnny Carson helped us go to the next step,” Hines says. As much as “Tappin’ Thru Life” focuses on the past, it also features a significant nod to the future with the inclusion of tap-dancing brothers John and Leo Manzari, whom Hines discovered in 2009 during a master class and open audition for a 2010 revival of “Sophisticated Ladies” at Arena Stage in Washington, D.C. He chose the pair, only 17 and 15 at the time, to make their professional debuts during the show, which he choreographed and starred in. Hines showcased their talents in the musical’s second act.